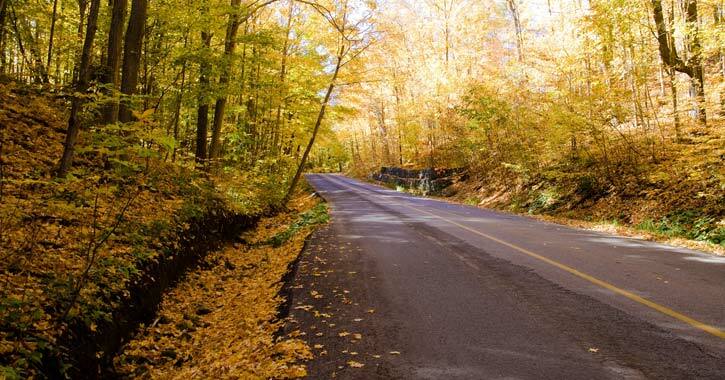 One of the best ways to see fall foliage is to drive along a scenic route, and the Lake George Region features plenty of them. With the help of our Lake George Facebook fans, we have put together a list of the Top 5 Scenic Routes to enjoy the fall foliage this season. This scenic route travels along the western shore of Lake George and extends from Lake George Village up to Ticonderoga - the entire length of the lake! View the mountains, mansions, and cabins along the way, as well as the beauty of the surrounding landscape covered in bright colors. In addition to hiking Prospect Mountain in Lake George, you can also drive to the top. The view is incredibly rewarding from your car, and Prospect Mountain Veterans Memorial Highway is typically open through late October. Go on a leisurely drive through Bolton Landing and admire the historic mansions, estates, and shops that make the town so charming. Lake George glimmering in the background reminds you that you are enjoying the scenic views of the Queen of American Lakes. With a name like that, it must be a great view, right? A drive up to Top of the World Golf Resort on French Mountain delivers one of the best views of the lake as well as surrounding mountains and foliage. Take it all in! Forget the car and go for a scenic ride on the water! How about a cruise aboard one of Lake George's steamboats or other guided tours? Enjoy the sights as you travel up and down the lake.